Tablet computers and smartphones have become part of modern-day life, which explains the explosive growth of mobile gambling. For that reason, it doesn’t come as a surprise that the Mega Fortune progressive slot is now available at mobile casinos. This rewarding 5-reel slot is extremely popular among online gamblers due to its staggering progressive jackpots. 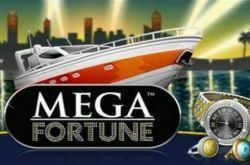 Mega Fortune is a video slot with 25 pay-lines and millionaire’s symbols, including gold watches, cigars, yachts, luxury cars and rings. There are also free spins up for grabs, in addition to wild symbols that increase your chances of winning. Three scatter symbols activate the free spins bonus mode, which enables you to collect up to 100 free spins. You need three bonus symbols on an active pay-line to enter the rewarding bonus round packed with three progressive jackpots. This bonus game invites you to spin the bonus wheel, which features four exciting levels. The first three levels allow you to either scoop a cash prize or gain access to the next level. You might ask: how about the three progressive jackpots? The first one, the rapid jackpot, is available in the second level. You can win the major jackpot in the third level, while the mega jackpot is up for grabs in the fourth level.